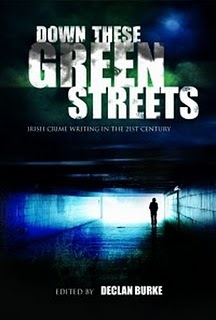 On his blog today Dec Burke announces the publication of Down These Green Streets, the definitive look at the history of Irish crime writing. For whatever reason crime fiction in Ireland today has become the dominant genre for this generation's writing talent. So called literary fiction is going through a stage of moribund middle class angst, the best Irish plays are being written by Englishmen, and contemporary Irish poetry probably peaked in the 70's with the circle around Seamus Heaney at Queens University Belfast. Almost all the exciting developments in Irish prose and certainly the most interesting Irish novels of the last twenty years have been in the crime fiction genre. Why is this the case? Read the book and you'll find out. There are essays by Dec Burke, Colin Bateman, John Banville, John Connolly, Ken Bruen, Stu Neville, Adrian McKinty, Tana French, et. al. The preface is written by one Michael Connolly and there's an afterword by Fintan O'Toole.